A beauty of a brown. May 8: Board Meeting at 7:00 PM. Members are welcome to attend any board meeting. Check with a Board Member to find out where the meeting is being held. We will be moving materials around a project site before a project day. If you have an SUV or 4x4 that you are willing to use to help stage materials, please let me know (heads up—this would mean putting some mulch bales in your vehicle). Sign up directly with Wildland Restoration Volunteers. RMF presents a program at the Loveland Children’s Water Festival to teach students about aquatic insects, trout, and predators in a dynamic stream environment. It is a day guaranteed to be filled with smiles. Contact Jerry Pelis for more details and to help out. Restoration work will be in the Rist Canyon area. Restoration can be seeding, mulching, or installing erosion control structures. Sign up directly with Wildland Restoration Volunteers. The High Park Fire ravaged over 85,000 acres of Northern Colorado lands, leaving hundreds of residents displaced and over 41,000 acres of land burned at a moderate to high severity! Whether you live downstream of the fire or in the actual burn area, please lend a hand and help restore some of the highest priority restoration sites within the High Park Fire area. The highest priority restoration work is estimated to take at least 3 years, and a great amount of community involvement. And it will not be possible without your support. Sign up with Wildland Restoration Volunteers. Staging and Restoration work will be in the Rist Canyon area. We will be moving materials around a project site before a project day. If you have an SUV or 4x4 that you are willing to use to help stage materials, please let me know (heads up—this would�mean putting some mulch bales in your vehicle). Restoration can be seeding, mulching, or installing erosion control structures. Sign up directly with Wildland Restoration Volunteers. RMF presents a program at the Fort Collins Children’s Water Festival to teach students about aquatic insects, trout, and predators in a dynamic stream environment. It is a day guaranteed to be filled with smiles. Contact Jerry Pelis for more details and to help out. Steve Henderson. Owner of Henderson Fly Fishing, Steve will share insights about fishing the Yampa Valley and it’s truly spectacular waters. Do you have questions about specific tying techniques? Are there materials that drive you nuts working with? Our own Ben Zomer will be at the bench answering questions about materials, techniques and trends. If you have any questions you would like to ask and have Ben demonstrate, email now so he can be prepared with the correct materials to answer questions and demonstrate solutions. Social hour begins at 6:30 pm at the Fort Collins Senior Center, and the program follows at 7:00 pm. We will have a local fly tyer at each general meeting and an equipment raffle following the meeting. This year the rods in the raffle are supported in part by Elkhorn Rod & Reel. Admission is free and the public is welcome. The Fort Collins Senior Center is located at 1200 Raintree Drive off Shields Avenue between Prospect and Drake. Additional meeting information. The most immediate goals of our post-fire restoration projects is to protect roads, reservoirs, rivers, homes and communities from the threat of further landslides and flooding expected in the coming spring months. Sign up with Wildland Restoration Volunteers. South Platte Dream Stream and Eleven Mile Reservoir: true Colorado gems. Can be tough and technical fishing. Most of us have been skunked there at one time or another, but many have also caught the fish of a lifetime in the South Platte. 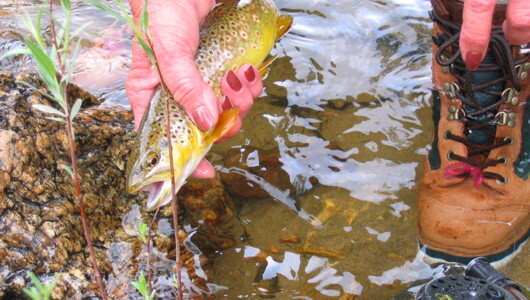 Option also to hit the Eleven Mile Canyon, a world class tailwater. Host: Dennis Cook. The recent storms have changed our calendar. We have a post-fire project on June 1st and need to stage some materials strategically. We will be moving mulch bales around the project site to facilitate an efficient work day. We need your help! If you have an SUV or 4x4 that you are willing to use to help stage materials, please let me know (heads up—this would�mean putting some mulch bales in your vehicle). Sign up directly with Wildland Restoration Volunteers.